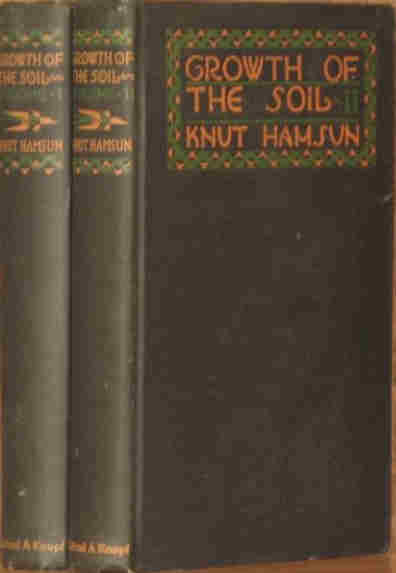 The Books In My Life: Another Noble Prize Winning Author- Collecting Knut Hamsun -Still Relevant Today? Another Noble Prize Winning Author- Collecting Knut Hamsun -Still Relevant Today? 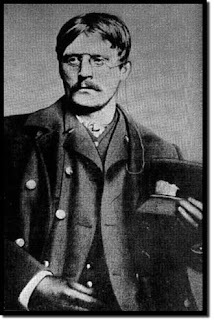 I recently read a blog posting concerning Net Neutrality and cell phone plans that reminded me of Knut Hamsun, winner of the Noble Prize for Literature, Lifetime Achievement, in 1920. The topic of the post was whether the government should allow cell phone companies to offer different levels of service to consumers for different prices. While this seems a trivial question, it does fall under the general law of Net Neutrality, which demands equal Internet access and services without price differentiation. Within the post I read, "If I’ve learned anything from my 45 years working with low income folks, it’s this: they’re intelligent and they’re resourceful. They have to be in order to survive....they have sense enough to know whether they’d rather use an extra $20 a month for movie downloads or for movie tickets — and would rather get discounts for services they do not want or need." That immediately took me to the major theme of Knut Hamsun's masterpiece novel, Hunger (1880, first English language edition 1920)), the quest to earn enough for survival (say, $5), and the observation that spending $5 is a serious decision to a poor person and never a difficult decision for a wealthy person. It made me smile to think that Knut Hamsun may have something to say on Net Neutrality over 130 years after the initial publication of Hunger! Knut Hamsun is an author in neglect today with only the power of his prose keeping his books in print. When he won the Noble Prize, he was considered Norway's greatest author and Hunger, the first modern novel of Norway. 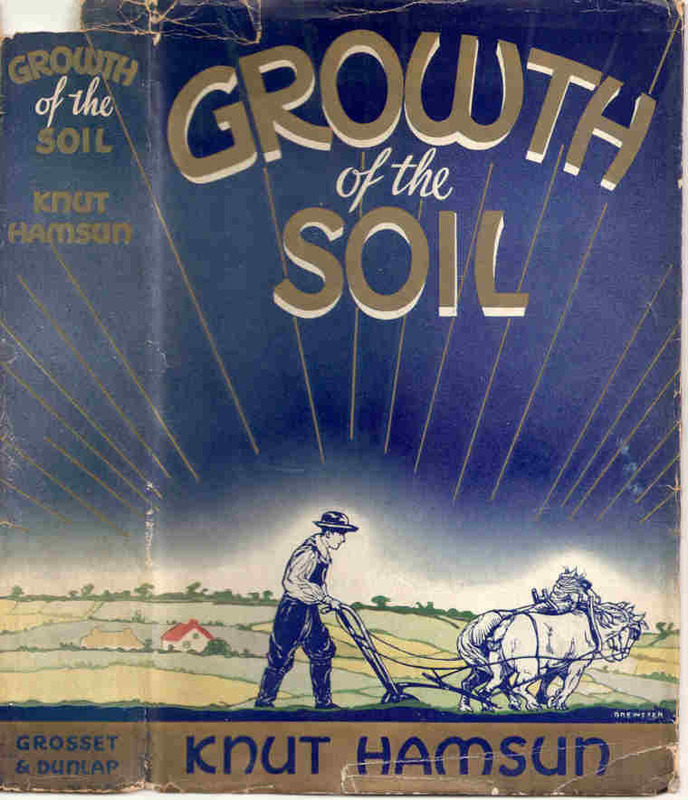 Hamsun's, Growth of the Soil (1917), is one of my favorite novels of all time, a powerful story of man surviving in a natural world full of challenges and pain but still supportive of life, lived. Hamsun is often credited (by Henry Miller, Thomas Mann and Isaac Bashivas Singer) as one of the founders of modern literature. He was not a fan of modern civilization and is considered a primitivist, calling for a return to a closer relationship with the land. Hamsun won the Noble in 1920 when he was 61 and the next 25 years were not kind to him. 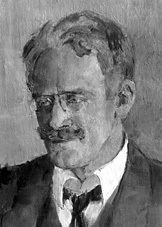 Hamsun had a soft spot in his soul for Germany and became a supporter of Germany's brutal occupation of Norway during World War II. Hamsun was a public fan of Adolf Hitler and fascism. After the War, suffering from the after effects of a stroke, he was found too old to be tried for treason. The people of Norway had no forgiveness at the time and while his books remain important, his reputation remains deeply tarnished. Celebrating the 150th anniversary of his birth in 2009, there was some effort to revisit his legend and books in Norway. Over the next 150 years, I believe his books will remain as powerful as when they were written and his thoughts on human nature as relevant. Collecting Hamsun is a challenging endeavor. In English translation there are 23 novels by Hamsun, 5 collections of essays and short stories, 2 works of non-fiction and 2 omnibus editions. Original publication dates range from 1890 to 1969 and even now, new translations of his most important novels are being published. If you are interested in collecting Hamsun, start by acquiring the biography, Knut Hamsun: Dreamer and Dissenter, by Ingar Sletten Kolloen, translated by Erik Skuggevik and Deborah Dawkin, Yale University Press, 2009 for a comprehensive introduction to his life and publishing history. I've collected some Hamsun over the years and continue to crave more! In 1920, Alfred A. Knopf, New York, was named the official American Publisher of Hamsun in America. Between 1920 and 1929. Knopf published 14 Hamsun novels in first English translation and his only play. These are all available and one of my personal collecting goals is to add to my Knopf collection by acquiring the 11 novels I don't have and the play! Collecting these titles is really not that difficult and I won't fret over not having a Growth of the Soil in the original slipcase since they are extremely rare. The Knopf editions are uniform in size and cover treatment and will make a wonderful display. 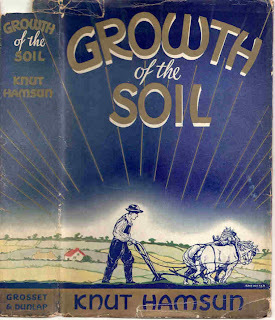 I do own both the two volume, Knopf, Growth of the Soil, 5th printing, July 1921 and the single volume, Grosset & Dunlap, New York, edition, 5th printing, October, 1926 (of the "popular edition," first printing, February 1923). Neither edition of this masterpiece novel are overly expensive but both are cherished books in my collection! Nobel or not, very hard to be sympathetic to someone who had 'a soft spot' for 'brutal occupation' and fascism....that said, in Will Smith's portrayl of Chris Gardner in The Pursuit of Happyness, one of the most poignant moments to me was when the future employer asked for a $5 loan for a taxi and Chris had to decide what to do, thinking that $5 couldn't mean as much to the employer....but it wasn't lost on him and he did pay him back....I wonder if Chris Gardner ever read Knut H.
As we know books collecting is best hobby of many people. Students also like to read interesting books in their spare time. Some books are famous which are written by famous authors and there are interesting real life stories in such books.